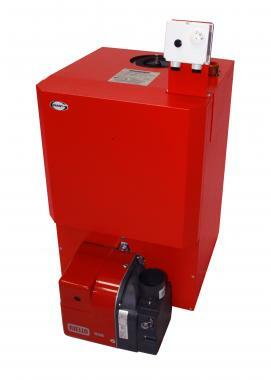 The Vortex Boiler House Regular Oil Boiler has been designed and manufactured by Grant to be placed in a garage or cellar, helping to save you space in your home and keep it out of sight. This floorstanding model is compact in size and has no complicated wiring or plumbing to make installation simpler and quicker. With this unit being designed with a red powder coated steel casing. It is a simple and quick unit to install with it having no complicated wiring or plumbing. This boiler is a highly reliable unit which uses condensing technology to deliver high efficiency level of 90.7% making the boiler A rated. The output rating of 26kW makes it perfect for the smaller homes with only one bathroom and not such a high demand for heating or hot water. This award winning product range features a unique Grant Vortex stainless steel heat exchanger and a Riello RDB burner with plug and socket connections. This boiler is a Regular unit which is also referred to as a conventional boiler or heat only unit. This means it will heat your central heating system directly and also producing hot water for your cylinder. This boiler requires a hot water cylinder which is often fed by a cold water storage cistern located in the attic; for this reason, this boiler type may not be suitable for smaller properties where space is limited. This boiler is available in outputs ranging from an 15kW to 70kW, ensuring there is an unit in the range to your home. This boiler comes with a 5 year warranty to give you peace of mind that you're getting a boiler of high quality.